For the past week I have had extreme attachment issues to my child. In many ways I feel like I’m that hormonal crazy person I was after having Octavian, finally feeling that magical bond with my son that I had waited 9 months to enjoy. Like those foggy newborn days, I want to be with him all the time (ok, I exaggerate, 98% of the time). Even when he is annoying the heck out of me and actively looking to piss me off, I just want to pick him up and smother him with hugs and kisses. Unconditional love, I get that, but this? Different. This love is so fierce, so all-consuming and so full of light and happiness. It’s the most amazing love I have ever experienced (the love for my husband is on the same level, but different). Of course, I have always loved Octavian and loved being around him; but I always felt the need for just a little more space (not his fault, I’m quite introverted at heart). I now find myself cutting my gym sessions short (or skipping them all together!) to spend more time with him. I miss him at night when he sleeps and secretly look forward to his midnight call for me to come cuddle and sleep in bed with him. My need for time off or time for myself has disappeared (assuming, of course, he still take his afternoon nap). For example, this weekend it was planned that Octavian would spend the night at Nana’s house. You guys, I didn’t want him to go. I wanted to keep him home with me. At the last minute I almost changed my mind and kept him home with us for the weekend. My husband kept me grounded and kindly said as we drove away from Nana’s house, “Don’t worry, Love. All you need is something to binge watch on Netflix and you’ll be OK”. So here we are, you guys. It’s Sunday morning and I survived- quite well, actually. After a run in the rain yesterday and hours shopping for fabric online for Octavian’s big boy room (even though I have no idea how to sew), the husband and I managed to sleep until 9:14am this morning. And now? Well, now I have a really long list of things I would like to get done when all I really want to do is shop for more fabric. So you may be wondering what all this has to do with this lovely Moroccan Beef Tajine. Well, nothing, but it’s pretty and impressive and completely delicious. 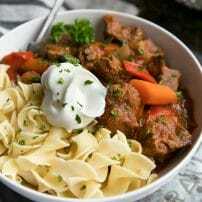 So changing the subject, let’s talk about this SUPER easy Moroccan beef stew. 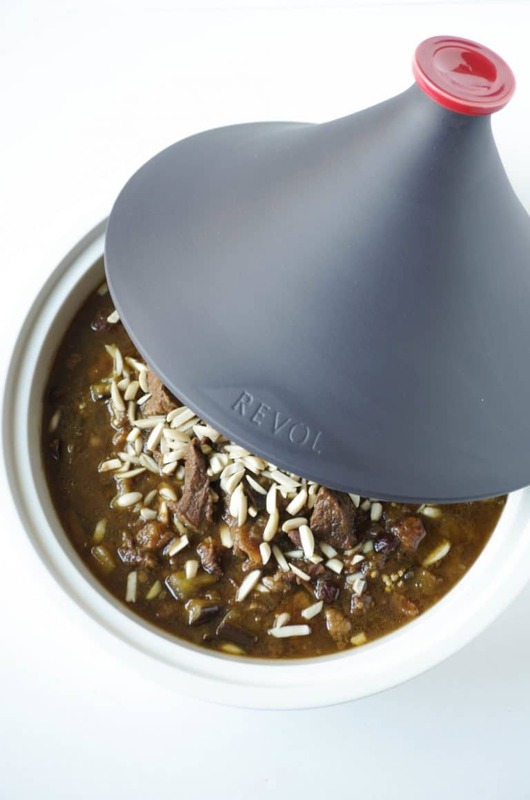 For a long time I had my eye on this Ceramic Tajine by Revol. 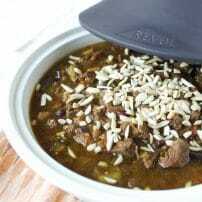 I love cooking and really love eating stews and Middle Eastern dishes and the tajine plays a vital role in their creation. 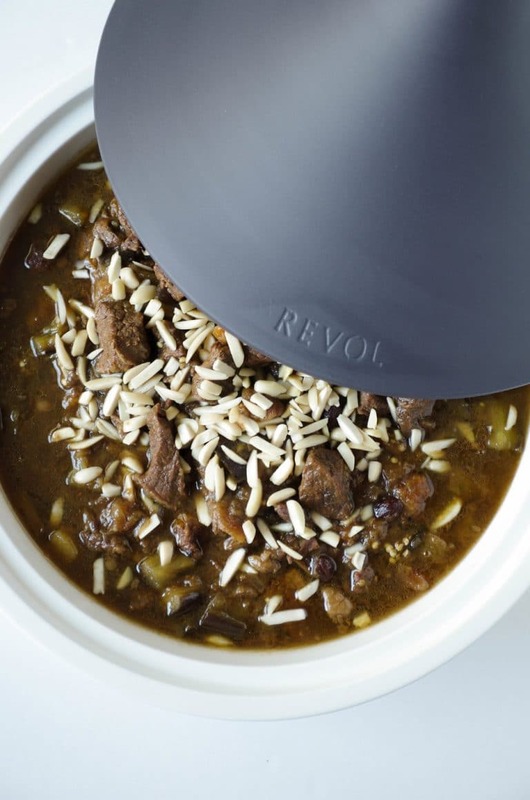 This Revol tajine is comparable with induction, electric top, stovetop and microwave AND it can go in the freezer and is dishwasher safe. 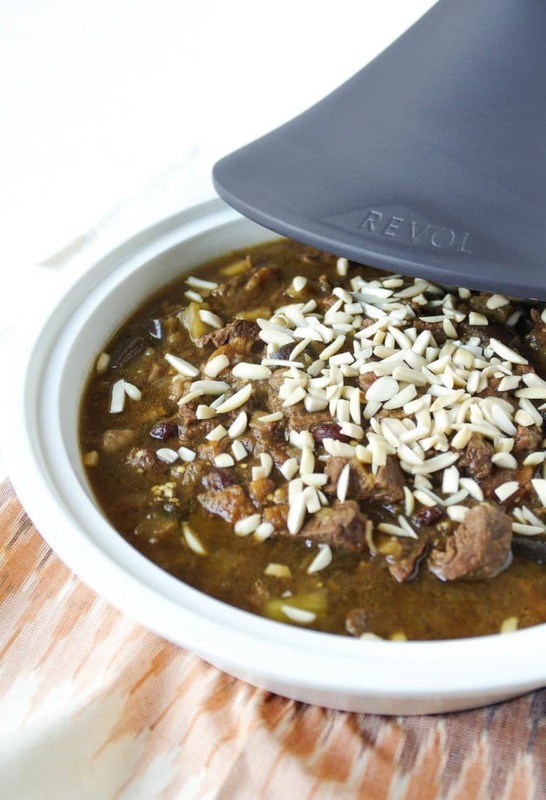 The ceramic used in this beautiful tajine is non-porous so it will not absorb fat, bacteria or odors and the material is 100% food safe. It has become one of my favorite cooking essentials. 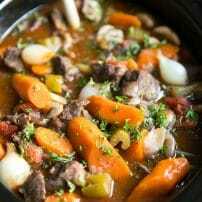 Don’t let the long cooking time of this stew scare you. The prep and work involved is SO EASY and it is well worth the wait. 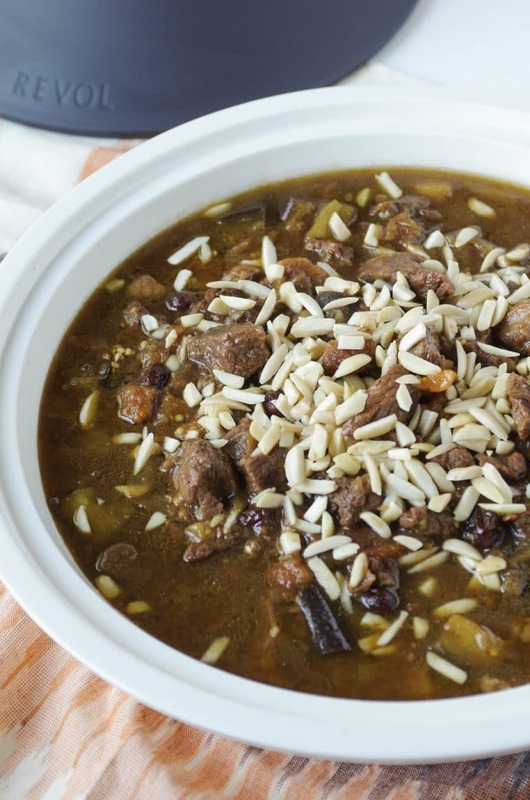 This stew is packed full of tender, fall-apart in your mouth beef, dried fruit and slowly cooked eggplant. The spices are simple, but so Middle Eastern, the smells will transport you all the way to Morocco. And it’s perfect for entertaining. Season beef with salt and pepper. 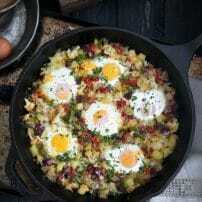 Using a tajine or large Dutch oven, heat olive oil over medium-high heat. Once heated, add seasoned meat and sauté on each side for approximately 3-4 minutes. 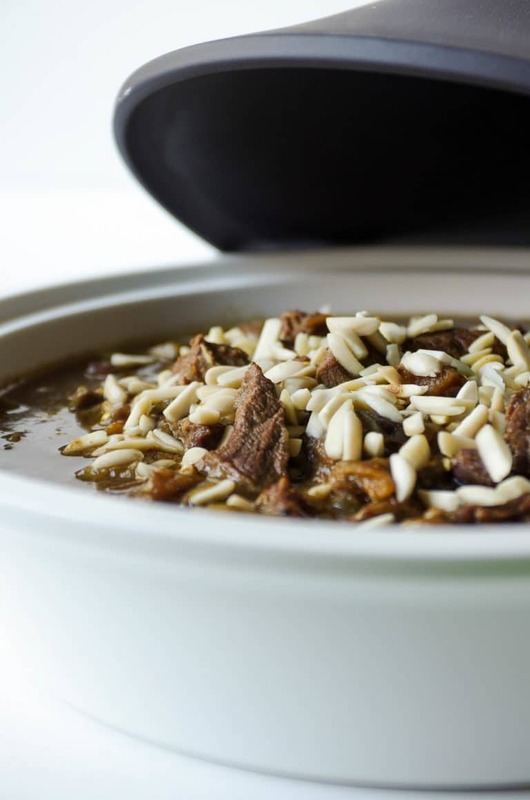 Remove meat from tajine and set aside. Add the onions to the pot and stir. Sauté until onions just start to soften and turn translucent (approximately 5 minutes). Return beef and any reserved juices to the pot and mix with the onion. Add ground cinnamon, cinnamon sticks, bay leaves, saffron, and cloves and mix again. Add beef broth to the pot, stir and bring to a low boil. Reduce heat to low, cover and simmer for approximately 1 hour, stirring occasionally. Add half the dried fruit to the pot and simmer, covered, for one more hour. Stirring occasionally. Add the remaining dried fruit and eggplant and mix well. If sauce is too thick, add 1/2 cup more beef broth. Cover, and continue to cook for an additional 30 minutes or until meat is very tender. Remove the bay leaves and cinnamon sticks and taste for salt and pepper. 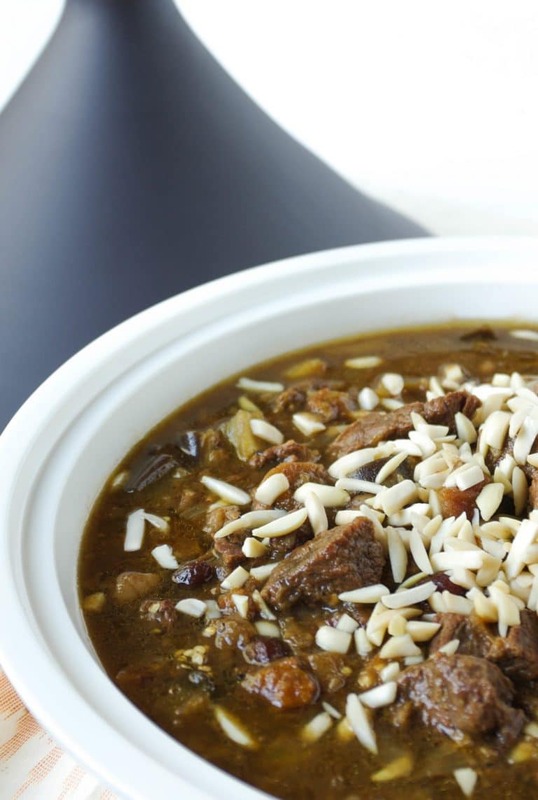 Garnish with chopped almonds and serve with couscous or fresh bread.